"Hold this thread, please," says Katy Schutte, our host for this ceremony, as we step into the Pit. I was there for Let’s Summon Demons. Pitched as a semi-immersive folk horror, I was starting to get a little nervous about exactly how semi this immersiveness was going to be. I hold the thread up by my head and Katy unwinds the spool down to the ground so that we now have a length of cotton that matches my height. She was taking my measure. A ritual that results in a piece of string that will come to represent me. By holding onto it, she holds onto a piece of me, to use as she will. We were going in deep. And fast. This was my last trip to the Vaults. Well, that's not quite true. 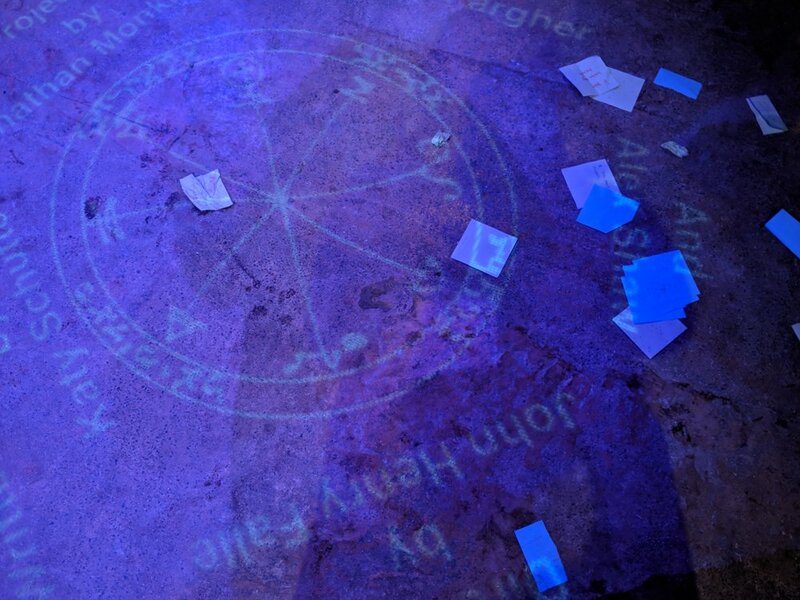 I have one more Vault Festival venue to go. But it's not in the Vaults tunnels, so perhaps it doesn't quite count. Now, I can see that look on your face. It's a look that says - Max, you lied to us. You said that Talented Mr Ripley was your last Vaults show. And now you're saying that not only was it lot your last performance at the festival, it wasn't even the last one to be taking place in the Vaults. To which I say... well done. You got me. But if you recall a little further back, I managed to turn up to the Pit for this show a whole month early. So really, if you think about it... this post is just an extension of that one. A four-week-long immersive experience, if you will. And, following on from that ribbon of logic, perhaps that is how it was meant to be. I was called to the Pit by forces unknown and unseen, for reasons that have yet to be revealed to me. Perhaps they wanted to make a measure of me too. In preparation for my return. "You can take a seat to the south," she added, standing back up, helpfully pointing to a bench just in case I didn't know where south was (I didn't). The Pit is the smallest of the Vaults venues, with just enough room for a narrow stage and three concentric circles of bench seats. The same benches I had found in the Cavern for Carnival of Crows. I think these must be the Vault Festival 'alternative' seats. Their vintage/witchy/spiritual option, for vintage/witchy/spiritual artists. They're bloody uncomfortable. Perhaps that’s the point. You shouldn’t get too comfortable when dealing with demons. "I have a task for you," said Katy, once we're all almost sat down. "In the centre of the circle, you'll find paper and pens. I want you to write a message to a man who wronged you." The ladies to my left burst out of their seats and scramble to get started. They have words that need to be said. I grab paper and pen, not knowing what to write. I don't really have anything to say to the men who wronged me. I tend not to think of them at all. In the end I scribbled a short note to an old boss, before handing off my pen to the girl sitting behind me. It's then I realise that we're nearly all women. I look around. Only four men, in a room of women. I wasn't the only one to notice this, and when our host started passing out jobs, three of the four men were picked out as friends - female friends called by female names - and handed a piece of black paper from which they were to read at the appointed time. Elsewhere, someone was given a sealed envelope, my neighbour was given a bell to ring, and we were all roped in to sing. Unlike the sing-along at the Greenwich Theatre, here Katy actually spent time teaching us the words, line by line, with accompanying hand movements, and when the time came to break them out, the words appeared on the floor, to aid the lyrically challenged individuals amongst us (...me). A train rumbled overhead, sounding like a storm raging outside the Welsh home we were supposed to be staying in. "Who likes tea and would like to have their fortune told?" asks Katy brightly, holding up a thermos. "Preferably sitting in the front." A volunteer sticks up her hand. "It's genmai," explains Katy as she pours a cup and hands it over. "It's made with brown rice." But soon the tea is replaced by a small tin, and Katy is doing a three-biscuit spread while sitting on the floor. We all laugh as she tells us the significance of a jammy dodger. The lights flicker and dim. Candles are lit. A bottle of mead is passed around. A newcomer joins the circle. The laughter is louder now. Stilted. Nervous. The mead reaches me and I take a swig, passing it on to the girl sitting behind me. I don't want to be the person who takes their hands off the table. The honey sweetness makes my lips feel sticky. The notes are retrieved from the box. Katy starts reading. Tales of pain and anger echo around the circle. She steps back, opening up the floor to us to pick a note from the box and read it out loud. Someone reads my note. Katy returns to the centre, pulling her own message from her pocket. She reads it to us. These aren't silly games. Not anymore. The bonds of the witchy sisterhood formed in that damp house in Wales prevents me from saying what happened next. Besides, as Katy reminded us as we left. She has our measure. There's no telling what she might do with it.